News in over the weekend from Michael DiCondina at Hargrave Yachts that he's signed the 27.4m motor yacht Dani for sale. 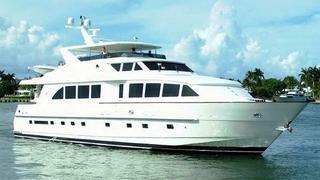 A raised pilothouse model, she was built by Hargrave in 2004 and delivered in 2005 as Lady Michelle. The first in the range of Hargrave’s 90 footer yachts, Dani features a family-oriented layout accommodating up to seven guests in an oversized master suite, VIP stateroom and twin cabin with a Pullman berth. Twin 1400hp Caterpillar engines give Dani a cruising speed of 18 knots and her asking price has been set at $4 million.